I discovered Trailmeme by reading the always excellent “Free Technology for Teachers” site by Richard Byrne and thought I’d give it a try. Trailmeme is a bookmarking tool that allows you to display a visual trail of your search results. You can add a Trailmeme bookmarklet to your browser toolbar. 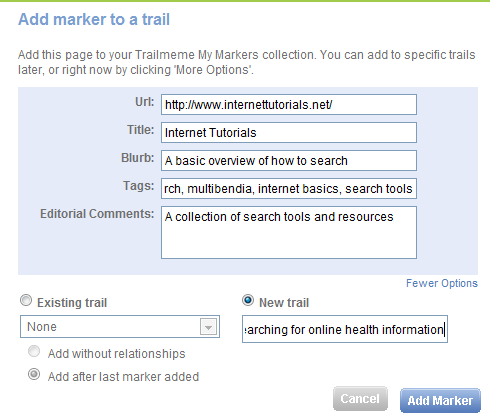 Clicking on it allows you to add a Web page to a new trail or a pre-existing one. You can link the page to a previous page or just add it to a collection that you’ll organize later. Even if you’ve linked pages together when you first created a trail, you can always reorganize your relationships later. Next, you’ll add bookmarked items to a trail if you have not already done so. You can also create a new trail at this point. Once you’ve collected the resources you want in a particular trail, you’ll start mapping. Your next task is to organize and/or reorganize your collection of bookmarks on your trail. Once you’re satisfied, you can make your Trailmeme public and share your trail to a number of sites including Twitter, Facebook, and via email. You can keep it private as well. As a learner, Trailmeme can allow you to visualize and reflect on your search strategies by visualizing your search trail. More importantly, you can organize the information you’ve found (or reorganize it) by creating relationships between your bookmarks. Here’s an example of a Trailmeme I created to assemble my personal knowledge management resources. The illustration below shows a Trailmeme I created to help people find credible health information online. The trail ends in a link to an interactive tutorial to check understanding. Here’s the link to this TrailMeme so you can see the Metadata I used. You can use Trailmemes as a stand-alone tool to connect different Web pages or you can use it to complement the navigation of an existing site you’re building, i.e., as a visual student’s guide. More best practices for using TrailMeme are described here. 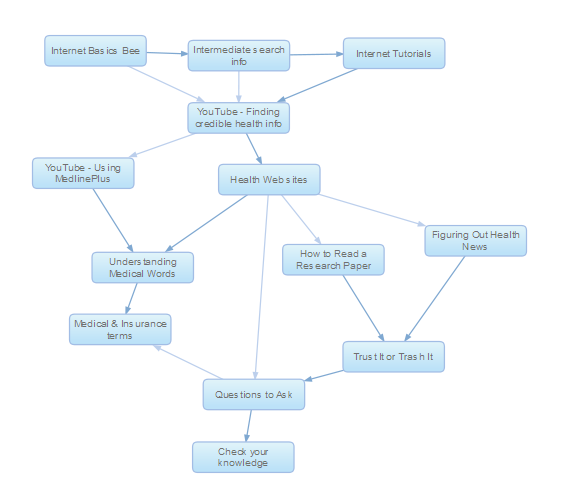 This entry was posted in elearning tools and tagged bookmarking, personal knowledge management, personal learning network, PLN, trailmeme, Web2.0 tools, website annotation. Bookmark the permalink.